Dale Willbanks Agency, Inc. Serving Southwest Colorado for 23 years, the Dale Willbanks Agency of American Family Insurance provides customers with auto, home and life insurance. Naughty School Girl Run Naughty School Girl Run Durango is an annual veteran’s benefit to support local area veterans. Emily's Etiquette & Events As a Certified Wedding Planner, Emily offers all encompassing wedding and event planning services as well as etiquette classes for the youth of the local area. Basin Coop For all of your fuel, tire, feed, livestock supplies, pet supplies, fertilizer, and fencing needs! Locally operated and member owned. Bayfield Glass Serving Bayfield and surrounding areas, Bayfield Glass specializes in windshield replacement and repair, residential glass, and rescreening needs. Alan's Electric & Solar Service Electrical and solar services, meticulously done by your local licensed master electrician and electrical contractor servicing all of Southwest Colorado. 15% off all Edibles & Drinks every Tuesday at The Greenery! Deals and discounts may not be combined. 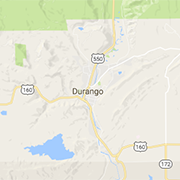 Durango's food and drink festival and summer-kickoff party.